14571 Coeur Dalene Court Chesterfield, MO. 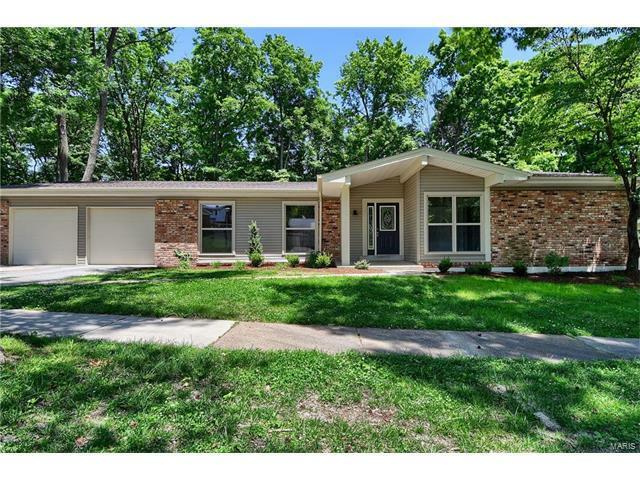 | MLS# 17044744 | Real Estate in Saint Charles and Saint Louis Areas, including Saint Charles, Saint Peters, Weldon Spring, O' Fallon, Wentzville, Dardenne Prairie, Creve Coeur, Chesterfield, Florissant, Hazelwood, Kirkwood, Des Peres, Saint Louis City, Homes for sale. BACK ON MARKET through no fault of the Seller**Don't Look Any Further, This Is "The One"!! Make no mistake that every inch of this *FIVE bedroom* ranch nestled in Conway Forest has been updated and is now Up for Grabs!! New wood flooring, fresh paint thru out, new thermal windows, new dual panel doors, updated bathrooms (all THREE). Kitchen updated with new cabinets with under cabinet lighting, granite countertops, gray glass tile backsplash, new tile flooring and new stainless stl appliances. Master bedroom has large walk in closet, full private bathroom with awesome rain shower. Brand new carpet in 3 other main floor bedrooms. Walk-out basement has 5th bedroom with walk in closet, a full bath, large fam and rec room areas, PLUS utility area. Yard has been tiered with brand new retaining wall added. New siding & new roof! Relax on the deck to the peaceful sounds of nature as this house backs to woods! Lovely details thru out this home!